1985 COLVIN Custom The 51 foot Colvin custom designed steel schooner, Journey, was built by Daniel L. Stoner in 1985. Home port is Sandusky, Ohio and is stored at Sandusky Harbor Marina where she can be inspected. It has been used as a Passenger vessel and certified by the USCG (# 939100) through June 2016. Most recently, the Journey was the centerpiece of the B-About Sail Ministry. Hull is a steel displacement type with keel and skeg rudder, Hull No. INZ083088018, and with the exception of the first 3 years in Florida, has been in fresh water (Great Lakes). The Load Length Waterline is 41 ft; beam 13.9 ft, and draft is 5 ft. Registered depth is 8.1 ft and displacement is 23 ton. Fuel is diesel with capacity of 81 gallons. Power is 120v AC and 12 v DC. Fresh water capacity of 300 gallons and holding tank of 100 gallons. The steel hull stem is curved with moderate flair and the transom is slightly rounded with the tumble home design. Hull-to-deck joint is welded and the superstructure is steel with venting cabin windows. There are two rows of lifelines, stainless steel bow rail, welded steel toe rails and scuppers from the cockpit and decks that drain overboard. Deck lines are yacht braid. Interior is wood with one head port forward. Galley is starboard of companion way and refrigeration is Norcold. Propulsion is Detroit Diesel 3-71N, 3 cylinders inline, 113 hp, rebuilt in 2014. Cooling system is a closed fresh water reservoir with heat exchanger and raw water cooled exhausts. Fuel tank under the salon sole. Steering system is hydraulic. VHF West Marine Zephyr; Uniden UM 380; West Marine VHF 500. Garmin GPS Map 498 and 6-inch Ritchie Compass. Safety Equipment (USCG Approved): Six Type 1 PDFs for Children and 20 Type 1 PDFs for Adults; 7 throwable cushions and 4 throwable life rings; fire extinguishers; flare kits; bell; FCC license. Twelve person life raft with strobe; bilge water alarm; manual whale pump fire extinguishing system; three first aid kits and a life sling. Aft bilge pumps are manual whale type. Steel masts with wooden booms and sails for Jib, Fore and Main. Main sail approximately 5 years old. A marine survey was last conducted May 10, 2014 by Waters Edge Marine Survey, LLC from Sandusky, Ohio. The overall vessel rating was Above Average and based on the BUC Used Boat Price Guide, the Fair Market Value was established at $105,600 in May 2014. The untimely death of the captain in early 2016 has kept the Journey in dry storage since the Fall 2015 to current. 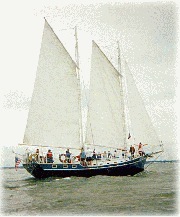 Camp Patmos (www.camppatmos.com) of Kelleys Island has clear title to the schooner and desires to sell quickly. No reasonable offer will be refused. Contact Gary L. Hoffman, 330.523.9007 (email: hoffmeister54@gmail.com) for additional information.